sqrt(x*x+y*y)+3*cos(sqrt(x*x+y*y))+5 – Google Search has webGL charts « Adafruit Industries – Makers, hackers, artists, designers and engineers! sqrt(x*x+y*y)+3*cos(sqrt(x*x+y*y))+5 – Google Search has webGL charts via twitter. Three words: Byoo Tee Full. 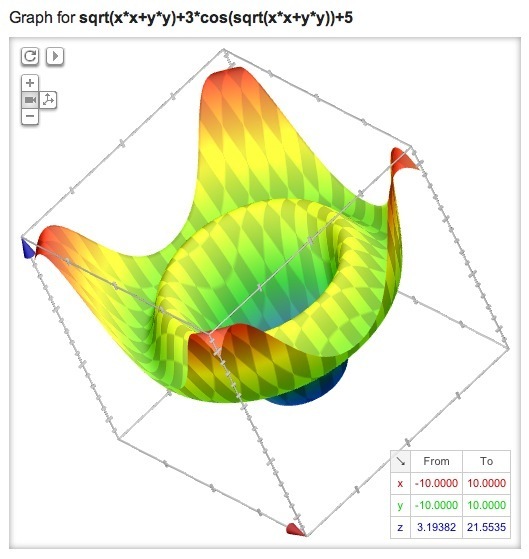 Very nice, almost better than mathematica.